I have a confession: I can't take full credit for the idea of this blog post. I have to give half...actually if I'm going to be fully honest- probably all the credit to my husband. It's actually kind of funny how this blog came to be. One day over this last weekend we were sitting in the living room enjoying some quiet time and the last bit of the day's sun. I was crocheting more and more of his never ending scarf when lo and behold he picked up a Food Network Magazine! Trying not to make a big deal of this (in my eyes) monumental occasion, I nonchalantly replied to his "Chocolate Dipped Corn Chips?!" with a brief, "Huh, really? Cool." Let me assure you, inside I was going "OH MY GOSH! WOOHOO! WHAT THE HECK?! OK, CALM YOSELF!" "Christina, we have to make these! They look awesome!" The next day we headed to the store, picked up some ingredients for this "snack" (his words not mine) and spent that afternoon making a mess these yummies and devouring them that same day. 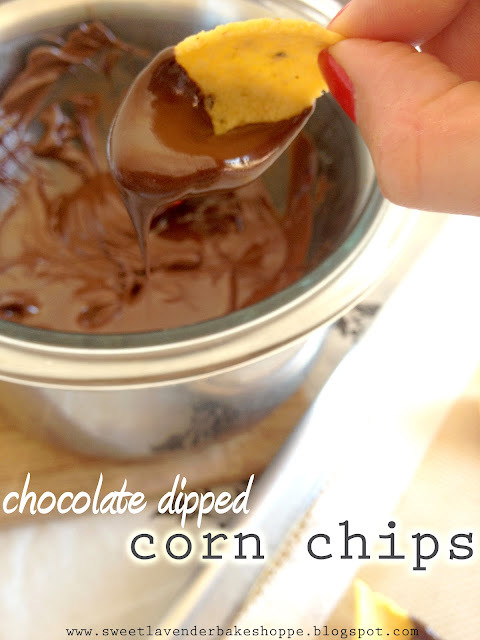 Another honest confession: At first, we were both trying to figure out if we liked these Chocolate Dipped Corn Chips. I'm no stranger to chocolate and salt, I actually prefer it...but it was the corn...ie flavor we weren't sure about. A few more down and we were hooked! They became pretty amazing and seriously addicting. We both ravenously ate the entire batch. I would however add a little sprinkling of sea salt at the end, just to up the salt factor. The chocolate sort of took away some of the corn chip's salt. Here's how we did it (a lot quicker than their version which required tempering) but for you advanced bakers out there, I'll include a quick tempering method as well :) We chose not to temper because we would be consuming that day. If you're planning on making and serving next day, I'd recommend tempering your chocolate. 1/2 cup good quality semi-sweet chocolate (bar form is the best). All we had were chips, so that's what we used! 1. First things first. You have to melt your chocolate. I know people say you can melt it in a microwave, but I personally wouldn't ever recommend it. It's just as easy to do over a double-boiler, and better for the chocolate, so that's what I always do. 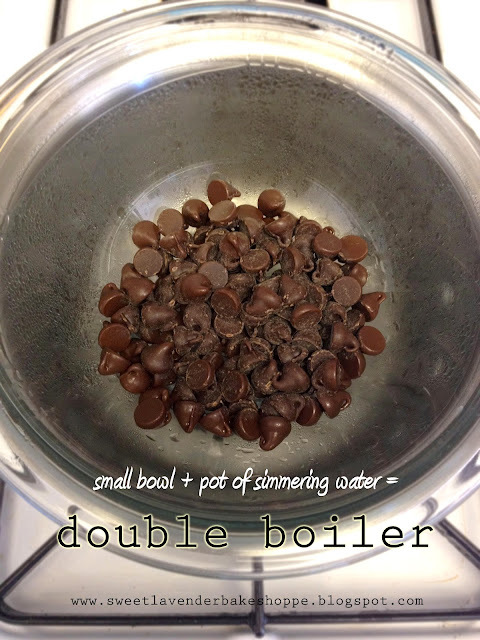 For your double boiler just take a small saucepan, fill it with about an inch of water, and bring to a gentle simmer. Next, place a glass (preferred) or metal bowl over that simmering water and add your chips. Do not get water in the bowl! This will cause your chocolate to seize. Bad. Also important to note- don't let the simmering water touch the bottom of your bowl. If this is the case, just empty some of the water out. Trust me. Stirring occasionally, keep bowl over simmering water until your chocolate has almost completely melted. Once you're at that stage, remove pot and bowl from heat and set wherever you plan to work. Use a towel underneath to protect counter :) Keep your bowl over pot the entire time. The heat from the water will keep your chocolate nice and soft for a while (which is good for dipping!) and prevent you from re-heating and re-melting over and over (which is bad for chocolate). Set 3/4 of chocolate over a double boiler, like normal. Melt the chocolate gently, stirring occasionally. With a quick-read thermometer, you want your chocolate to reach 100*F. Once it reaches this temperature, take your bowl and place over a bowl of cold water. Stir in the remaining 1/4 of chocolate until melted and your temperature reaches about 82*F. Once you've reached this temperature, place your bowl BACK over your pot of simmering water and bring back up to about 88*F. Then, dip away! *To rewarm this, just bring back to 88*F.
**NOTE: If you're using dark chocolate, your temperatures will be different. The third temperature you're looking to reach is 90*F.
If tempering, just let cool and dry at room temperature for at least 30 minutes or up to 4 hours! Store overnight in an air tight container in a single layer. Do not place in fridge! I would recommend eating that day or latest next day. 2. We chose to let our dippers dry on a silpat (nothing sticks to this thing), but feel free to use parchment or wax paper. Lay out your dippers and let the dipping begin! This would be very fun and easy for little ones to do! 3. Once you've dipped all your chips, you can sprinkle with a little salt before chocolate has set. Place in fridge for 15 minutes or until hardened and then consume away! Can sit out, in a single layer, at room temperature after this...although I would recommend eating day of. We kept some overnight in an air tight container (sitting room temperature) and the chip part submerged in chocolate was a tad soggy the next day. This is the best part, right?! Please don't forget to lick that bowl. We are the same way with magazine around here! His are boring and mine are full of food & decorating & awesomeness! I've had potato chips dipped in chocolate and I LOVE those! Sweet\salty anything blows my mind! But i have to admit that corn chips & chocolate sounds not as good. But I'll take your word for it and try it! But honestly, I'll pretty much eat anything dipped in chocolate, so this won't be a stretch. I absolutely love this idea!! And your pictures are just amazing! !